How time flies! 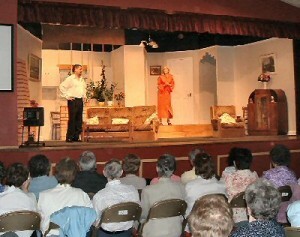 Already we have seen one third of all the plays in the 2012 Newry Drama Festival! Bart’s opening on Friday night was competent, distracting and pleasant: I expect no kudos to come their way though. Ballyduff (Saturday) and Nenagh (Sunday) were both outstanding in their own different ways: Waterford displayed an exceptionally talent youth section and the production was excellent. Tipperary gave a masterly technical performance, especially in set, lighting, costume and sound. I expect them to win an award in the latter category. Both performances however left room for improvement. The Judge was weak in The Crucible: the over-ornate and technical set restricted the cast of Jekyll and Hyde. The best is yet to come. I look forward especially to Silken Thomas’ Jerusalem (Friday) and Newpoint’s Beauty Queen of Lenane (Thursday). Tonight it is Clarence with Weekend Breaks.